The contrasts are stark. The first thing that I notice is the refinement in both style and observation. The painting which springs from observation is far more developed in the 2012 Linwood piece. 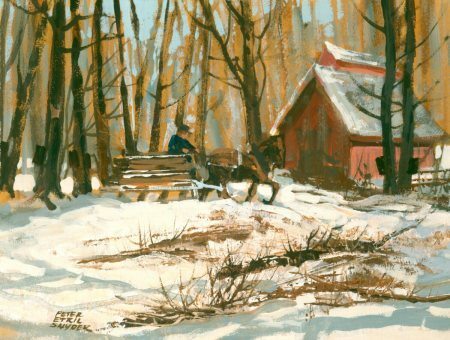 In the earlier painting from 1969, I am showing a scene as I thought it to be. In the Linwood piece the amount of study of the subject is clear. No longer am I painting by memory, now I am painting with careful reference materials (photos). Another contrast is the simplicity in the earlier piece. The complicated composition in the Linwood painting shows many years of picture making. This work is considered and developed, while the earlier view is a quick impression. 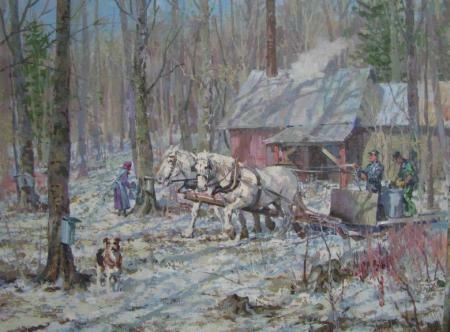 Follow the creation of the painting, Maple Syrup Making Near Linwood.